“Museum of Cycladic Art is one of the most important museums in Athens and sole ambassador of the Cycladic civilization and artistic legacy. 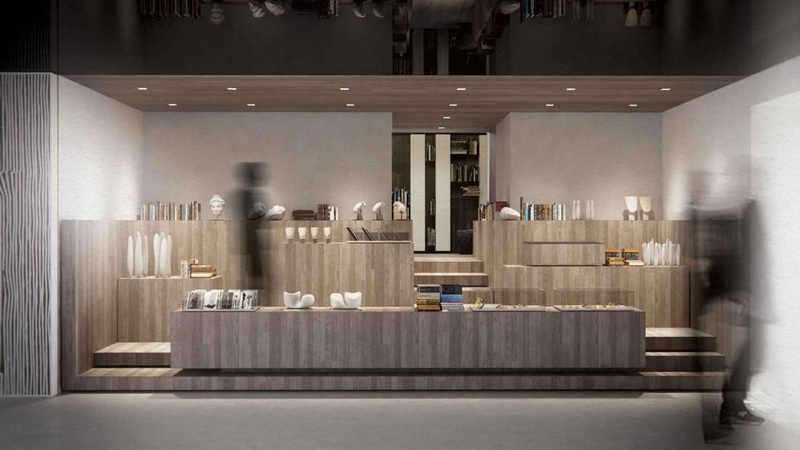 Our goal was to reveal its identity and expose it to the wider public by transforming it to an urban icon not only visually as a semantic carrier but also functionally by increasing the permeability of the building from the street to the interior. 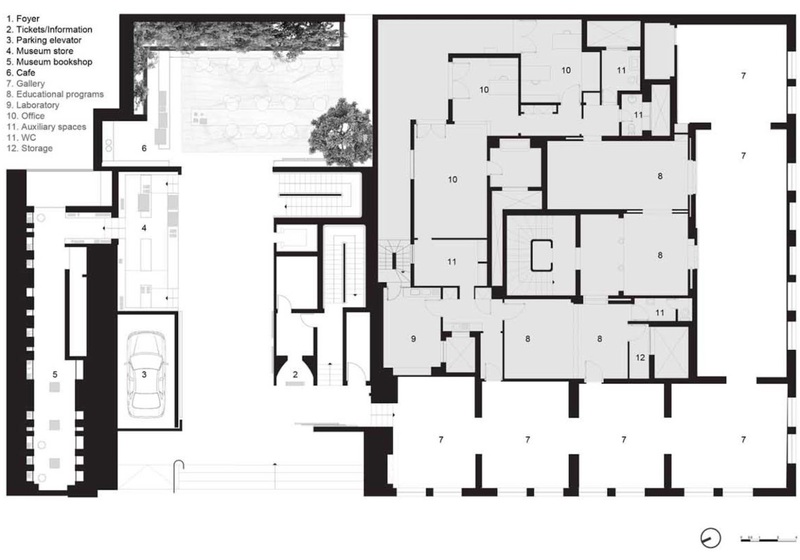 MCA is situated in the very center of Athens, where public open space is scare and the building density is high. The museum’s existing façade is reminiscent of museum typologies’ facades of the international style, encased within the tight urban fabric. The larger portion of the facade area is covered with reflective glass panels which on their inner side are covered with rigid panels to prevent sun to reach the exhibition rooms where steady conditions of lighting are required. The function of the windows becomes secondary. We wanted the site and the museum to realize its potential. 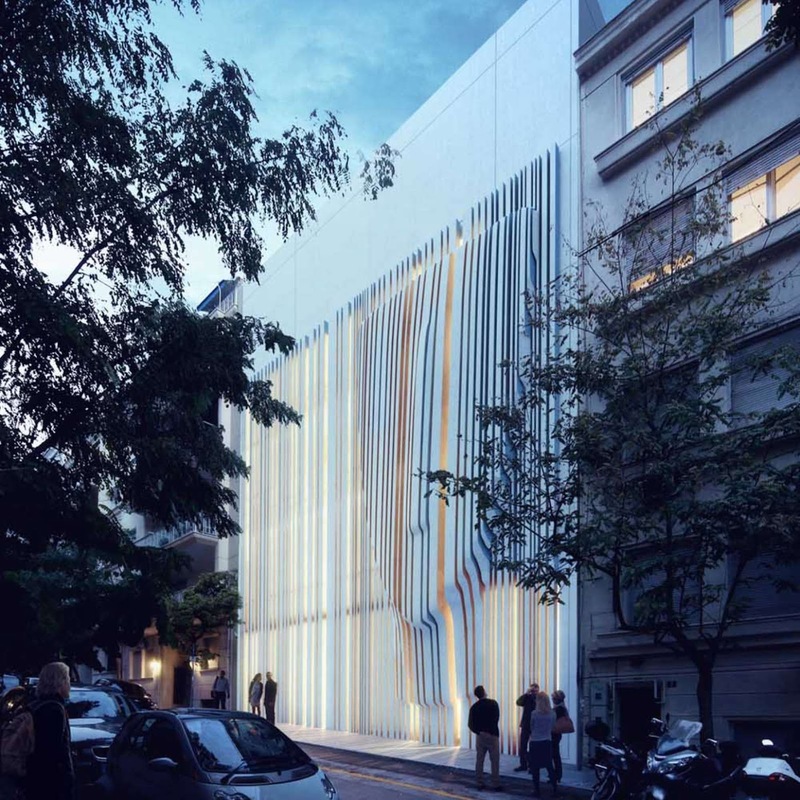 We designed a façade that will work with the current one and will enhance the museum’s presence. 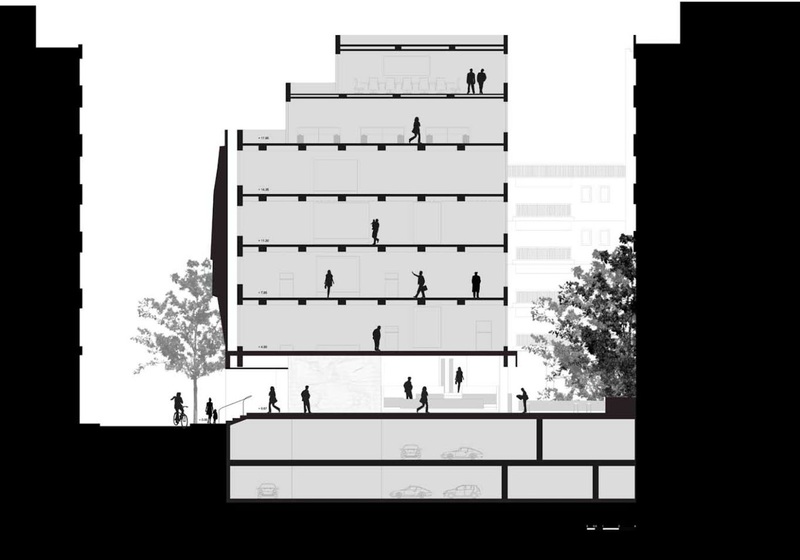 The proposed façade is designed to provide shade and privacy in the desired location, act as a thematic scheme for the museum and constitutes a pause to the visual ambiguity of the aggregation of buildings that comprise the street facade. 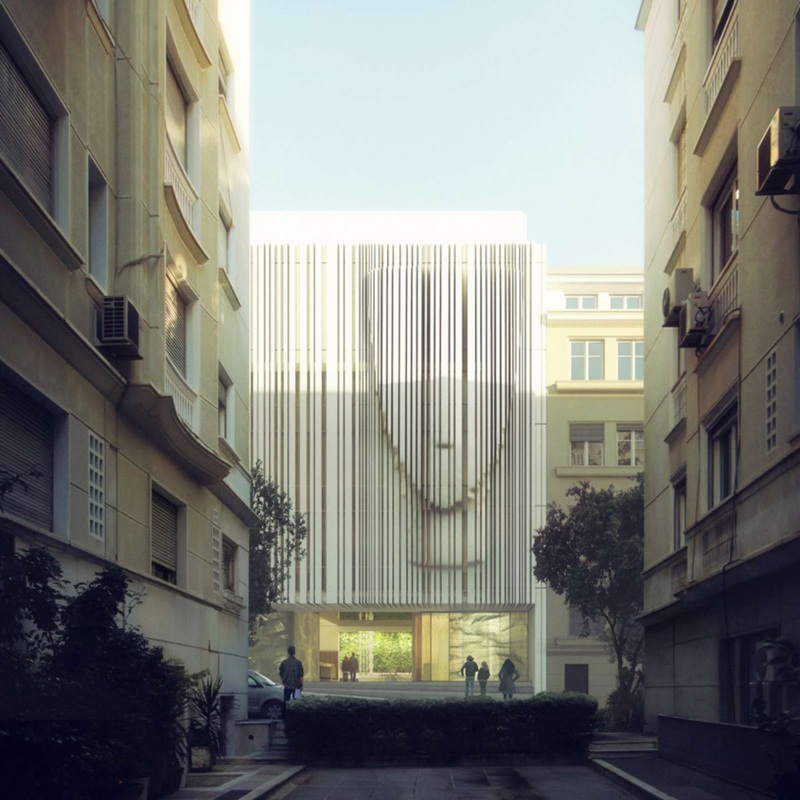 We envisaged the museum façade to float above the street in order to create a clear and unmistakable entry point, to draw people from outside, to provide shade, shelter and a n urban meeting point The proposed façade creates a new entrance and connect the atrium that is flooded with light during the day with the street. 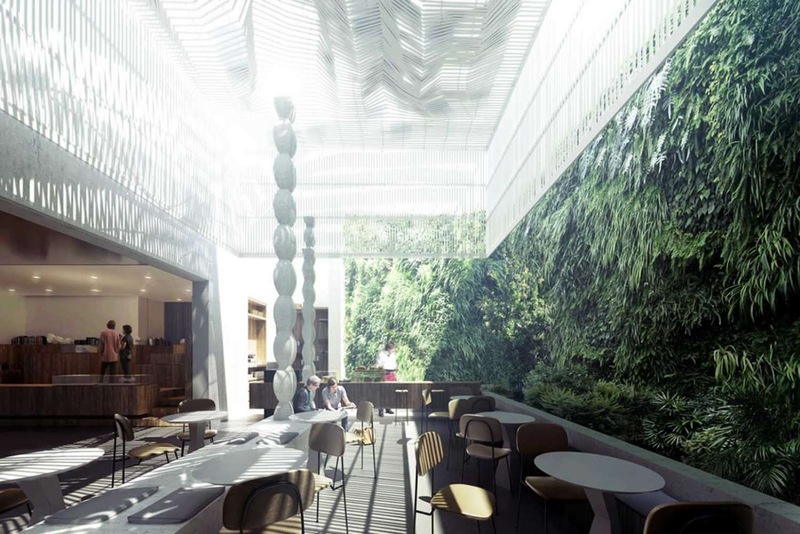 The atrium with the café and the nearby shop becomes the destination of the route, an oasis of light and vegetation in the interior of a building block. This inner open space building provides for ‘stasis’ in a state of constant urban kinesis. The façade is open during the museum opening hours letting the interior to act as an extension of the street, and closed when the museum is closing. 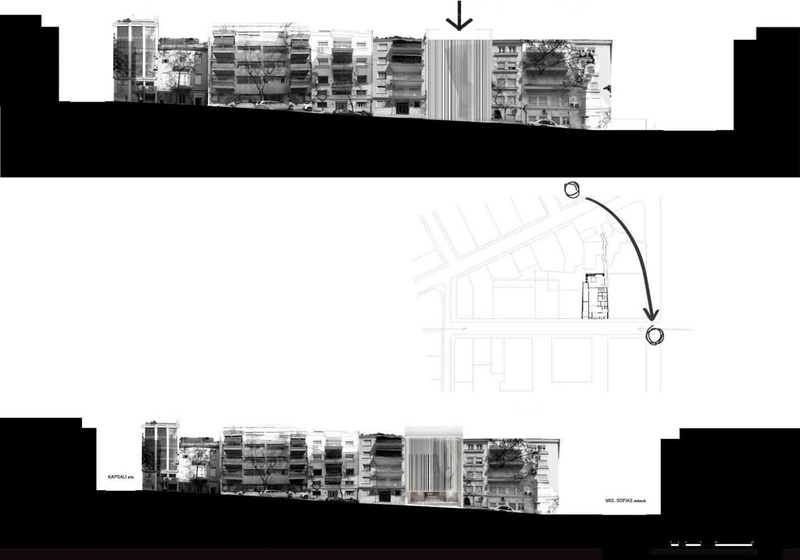 This periodical movement not only becomes an architectonic event introducing different degrees of access and permeability but also becomes an urban event. The new façade comprises of an array of vertical elements in a calculated synthesis. The careful arrangement of the vertical elements resolves certain problems of transparency, privacy and lighting conditions manifested in the previous façade. The linear synthesis was inspired by natural Cycladic rock formations and alludes to the fragmented landscape of their origin. The outline of an anthropomorphic figure is created by the topological differences of the elements of the synthesis. It is a tectonic version of the Early Cycladic (2700 BC) marble head figurine, of Spedos variety, part of the collection of the MCA. The Cycladic sculptures all possess certain features –canonical, proportional and simplistic, are considered to be the first sculptures to be made of Parian marble and an important influence and inspiration for the modern minimal movement. They are sculptured with such skill and lightness that can only be rivaled by the touch of the sea on the pebbles of the shore. The Cycladic head alone is an icon for the Cycladic civilization and culture but most importantly a timeless symbol of artistic deductive ability and simplicity that has affected artists like Pablo Picasso, Constantin Brancusi and Henry Moore. The topological differences of the facade elements that form the ‘’head’’ create interplay of light and shadow that changes and progresses as the day passes and the path of the sun is captured on the façade” Kois associated architects.